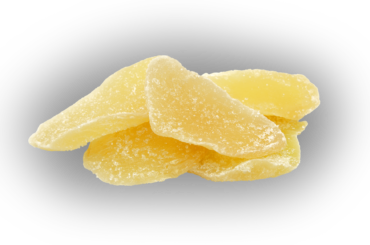 Crystallized Ginger is a chewy, sweet and spicy treat that is made from the tuberous root of a small, tropical plant. Ginger originated in India and South Asia and became especially desirable to Europeans during the spice trade. To the Chinese, ginger is considered a “yang” – a hot food balancing the “ying” of milder, cooler foods, thus establishing a kind of culinary harmony. Ginger has many applications; it is ideal as a spicy treat, a medicinal herb, flavoring for soft drinks and teas, and as a bold ingredient for cooking and baking. Ginger has a long history of use in various forms of both traditional and alternative medicine: used to aid digestion, reduce nausea and alleviate symptoms of the flu and common cold. Ginger’s unique fragrance and flavor come from its natural oils, the most important of which is gingerol, the main bioactive compound in the plant and responsible for much of its medicinal properties. It has powerful antiinflammatory and antioxidant effects. Most ginger is produced in Asia, though there is substantial production in Africa and some in the West Indies. India and China are the largest producers. Red River sources nearly all its ginger from Thailand. Raw ginger is cooked until it has softened and is then rolled in sugar as a sweet compliment to its spice.